This month I held my first master class. 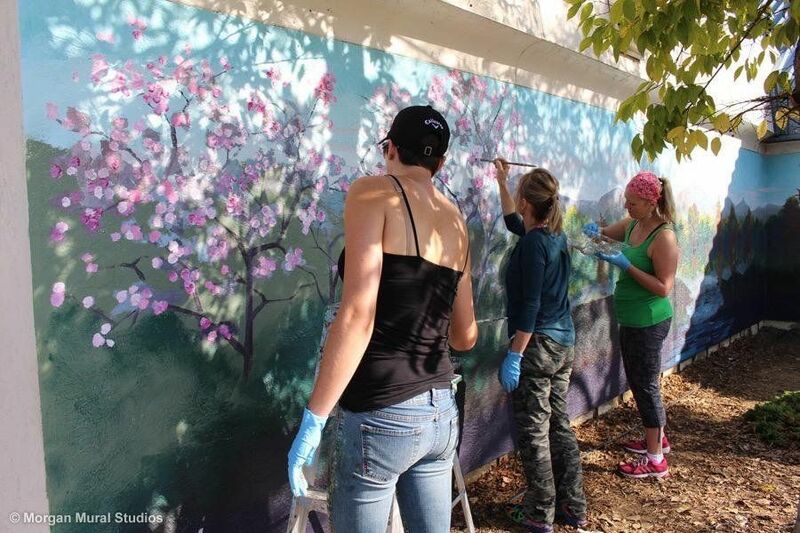 My goal was to train a handful of people how to paint an exterior mural so they could share their creative gifts with the world through public art projects. Out of a field of talented applicants, I selected candidates who had already established art businesses, and who could most likely put to use what they learned and expand their art offerings.I chose the apprenticeship model for this class- out of the classroom and into the world- because I wanted to share all aspects of the work. The “real work”. From the bid to concept development, wall preparation to painting and wrap up, I invited the class along with me through the entire life cycle of the project. 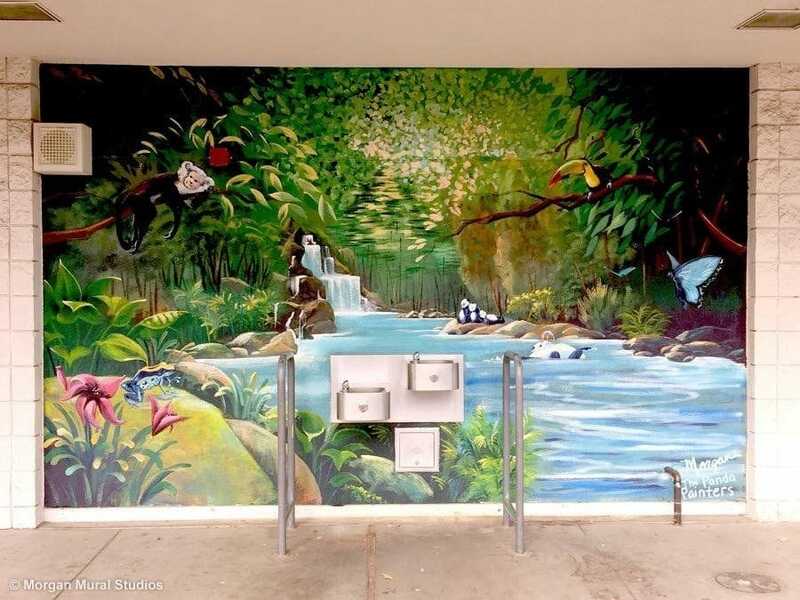 We completed four murals in our five-day workshop, covering about 1000 square feet of blank stucco walls with colorful nature scenes. 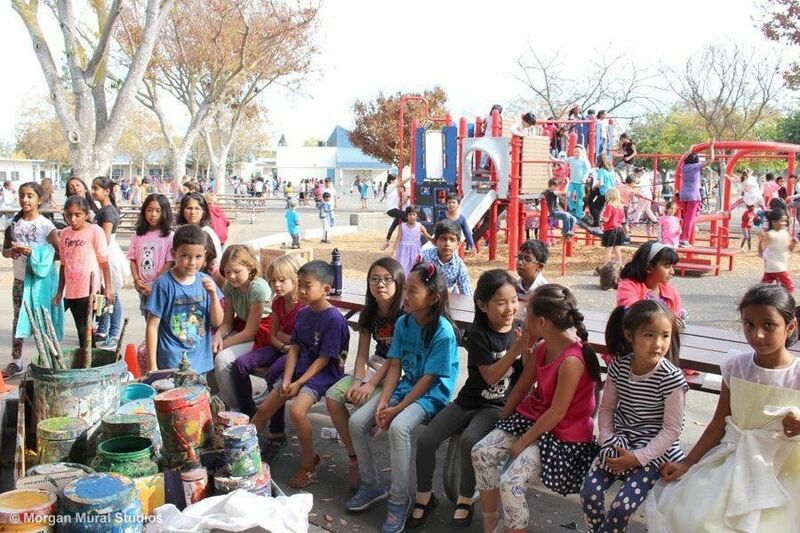 The recipient was Stocklmeir Elementary School, a school of 1200 kids located in Santa Clara. 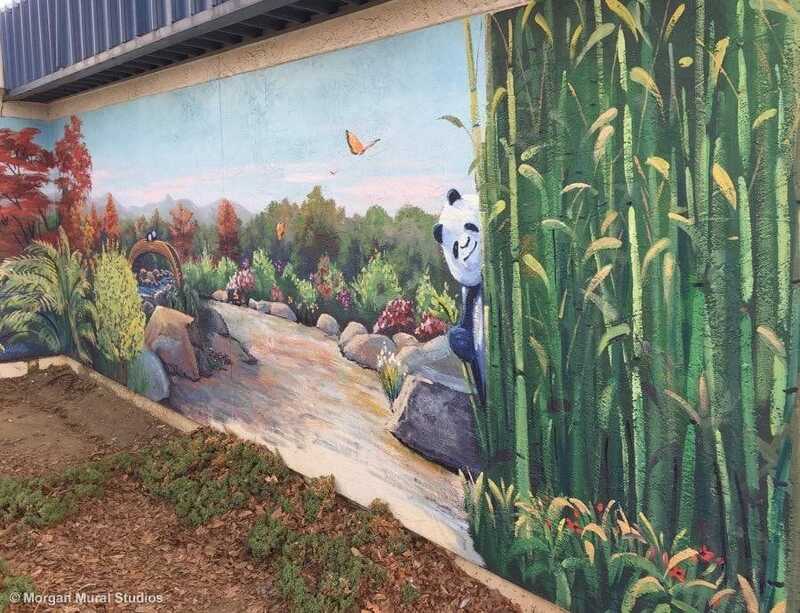 Their mascot was a panda; so all the murals contained pandas. 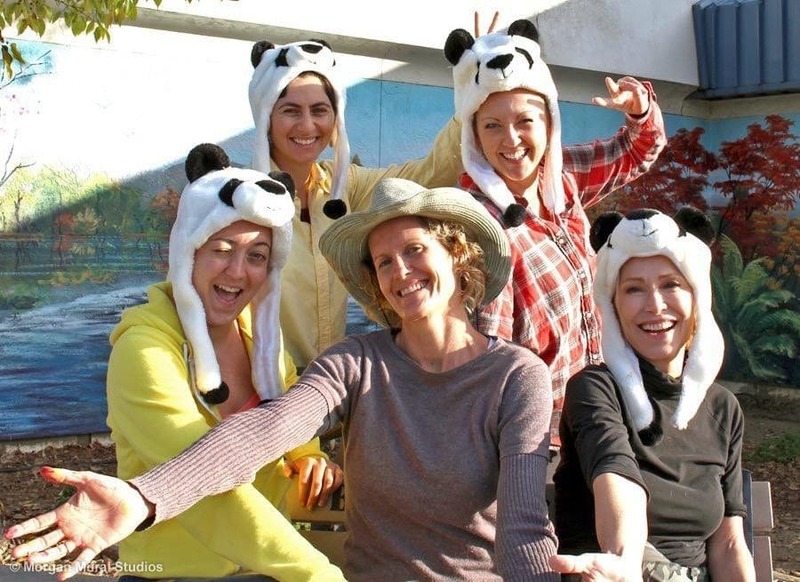 Together, we were “The Panda Painters”; Natalie Way, Sonya Kleshik, Jolene Russell and Julie Hansen joined me in this art adventure. Not only did the master class share in the work with me, we also shared in the overwhelming appreciation from the kids and school community. We felt like rock stars being clapped in at the school wide assembly. The collecitive “wow” from the classes that came around the corner to see the wall for the first time is maybe the happiest sound on earth for me. I want to record it and set it as my ring tone. 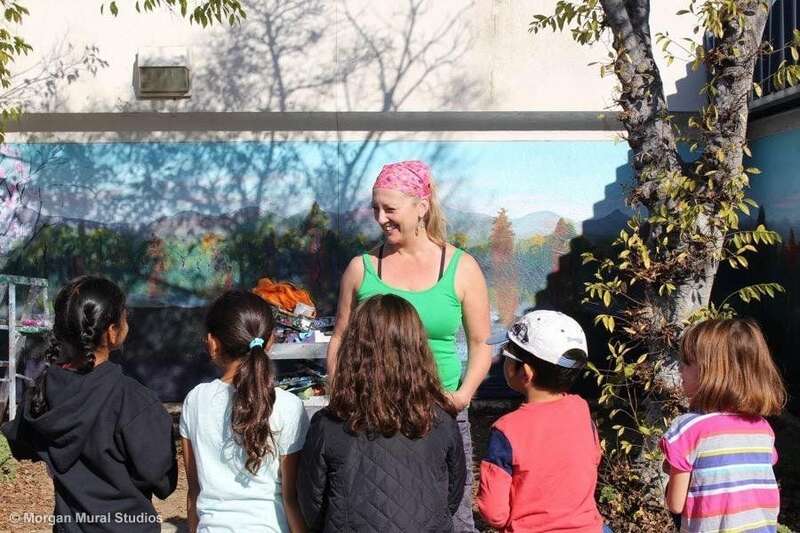 When Sonya was fielding questions from the students, one girl came up and told her with utter sincerity, “I want to be just like you when I grow up.” A mom came up with tears in her eyes and shared with us how long she had wanted the school to put some art on the walls, and how beautiful it was. Every day we were touched by the appreciation.At the end of the project, we were each presented with a stack of thank you notes made by the kids. We sat together at a Starbucks one evening and opened them together, laughing to tears at a few. (Thank you for painting graffiti on our school walls.) It was precious. I think a major lesson of the Master Class for all of us is this kind of artwork, this experience, is wholly separate from gallery art. This is art as service. After so many years of working on my own, it was challenging to put into words each step of my process and why. For example, for longevity and paint integrity of exterior murals I start with a few coats of solid paint on the wall. I work in layers, so the bottom layers are about getting a lot of paint on the wall, and I don’t worry too much about shape and detail of the elements. The subsequent layers are more like honing a sculpture out of the amorphous clay. I have never had to describe this process and I am learning this is not a typical way to approach painting. It took lots of encouragement to keep the artists from getting into the details of what they were painting in early layers.A few days in, we all laughed to tears when I “caught” Natalie “dry brushing” during the second coat. Mabye it was the heat and fatigue, but Natalie had us is stitches of laughter throughout the day. We were an easy audience. It was interesting to hear the observations of the workshop participants. 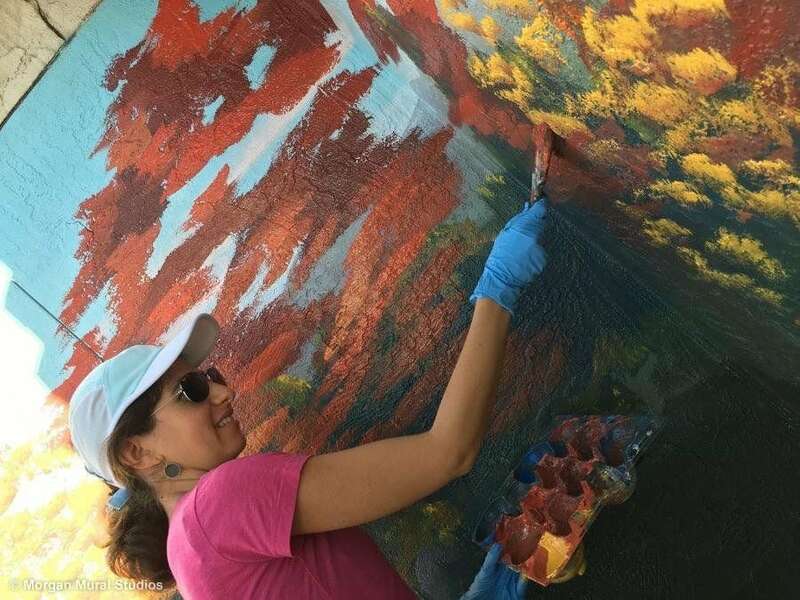 Sonya, the only artist who had not painted a mural before, commented how painting the mural was “a full body experience. The wall is a huge physical entity, I feel like it surrounds me. [When I paint on canvas] there is no physical element to my creativity.” This is exactly why I enjoy painting murals, but I could not have put that into words. Although, after overhearing conversations about Advil dosages on the fourth day I took a clue that maybe I should ease up as taskmaster.In retrospect, I now see where my impulse to cover such a large area in a short time comes from, and why I kept encouraging the students to let go of the “preciousness” of each brush stroke and “move along” as they painted. Overthinking, and tedious effort are obstacles to my creative flow. For me, the physicality of painting a big wall is an essential aspect of this creative absorption. I wanted them to get out of worrying about if their flower or animal was “good”, to not get snagged on the details but instead relax into the process, building up the layers of color, and let the work develop as a whole. This is something that I love about my work, and I hoped the class participants could also experience this feeling of complete absorption into the work. During the course of the week we knit together as a team. Everyone contributed to the actual artwork, but also developed distinct supporting roles. Julie washed buckets of dirty brushes in the custodian’s closet. I never even met the custodian or found out where his workroom was, which is not how I usually roll. Sonya was chief photographer. We took advantage of Jolene’s height; she was repsonsible for paitning the top foot of each mural. Natalie was our designated public relations committee; she had the patience to field questions from the many curious kids that surrounded our workspace. 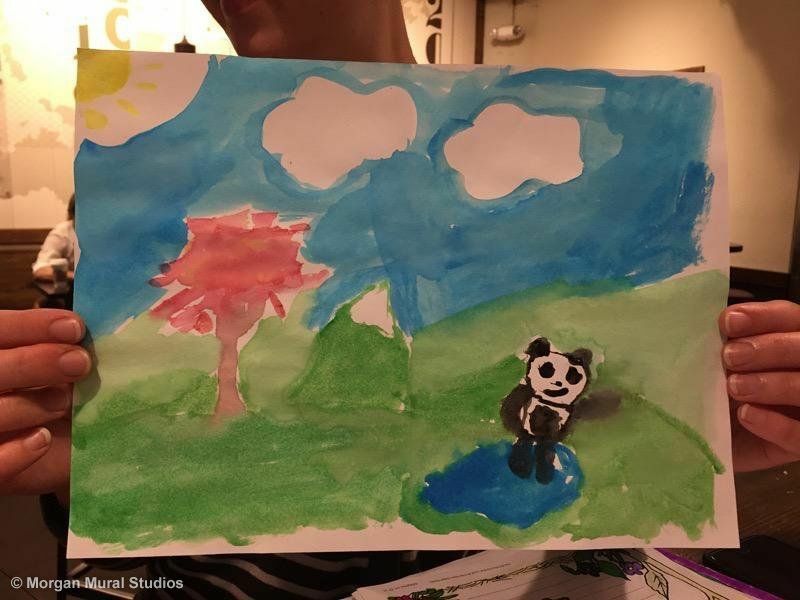 The most common questions included: “Are you going to paint pandas in the mural?” How do you paint like that?” And, “Are you an artist?” Thanks for being our front man, PR! The project would not have been such a success without the trust and support Audrey Prouse, the Assistant Principal. From the start, Audrey was game for the adventure and provided us daily homemade snacks and encouragement while we worked onsite. This project was funded by the school PTA, so the school community was a key supporter and participant in the project as well. I am grateful to Jeannie Leahy and Anh Hodges, two dear friends and neighbors who stepped up to house the workshop participants. 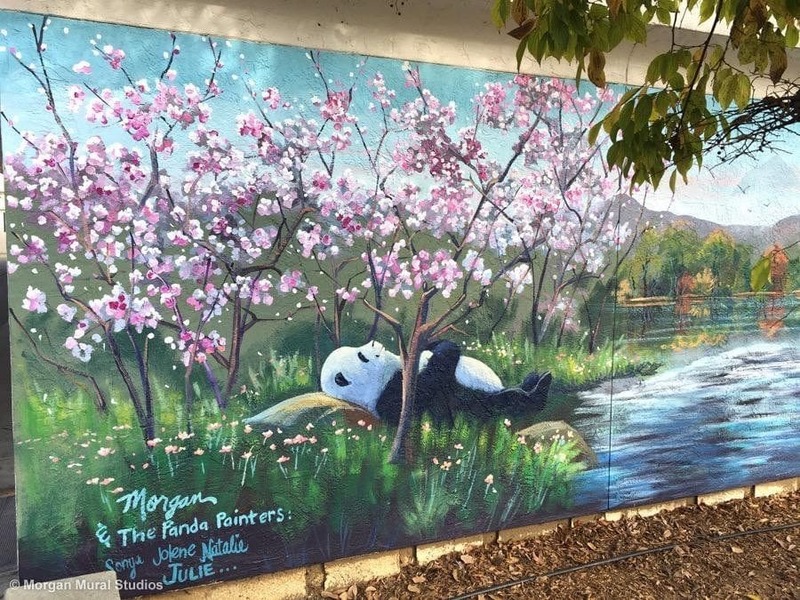 Finally, I am grateful to each Panda Painter for their enthusiasm and support. 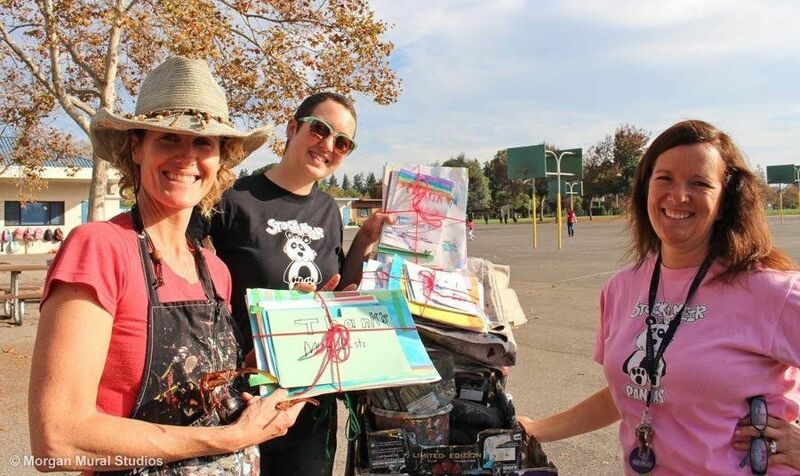 Natalie, Sonya, Jolene and Julie: the project was more beautiful because of your participation. 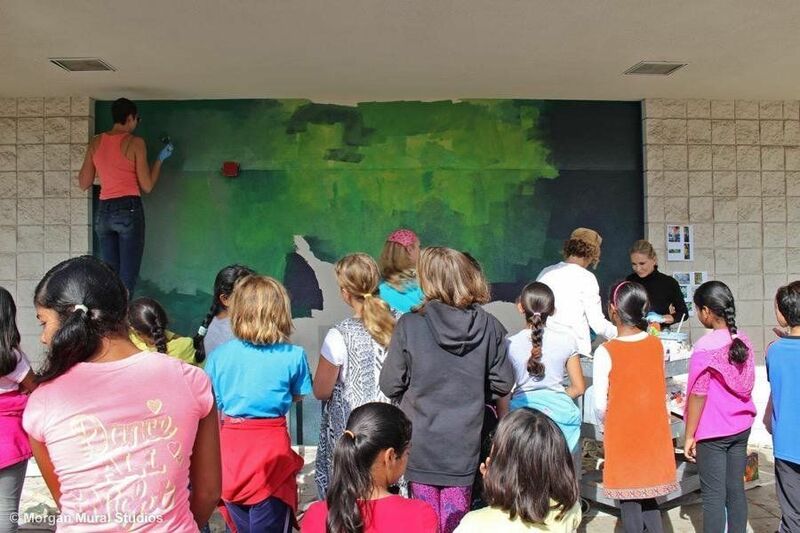 I hope just a few students at Stocklmeir Elementary school will look on the great sky of the new murals at their school find their own wedge of freedom and inspiration to follow their dreams to become artists themselves. I hope you enjoy your Thanksgiving and that Thursday finds you surrounded by good company and good food.